The author’s classroom, ready to go for the new year. Changes to a learning environment are often driven by the teacher’s philosophy regarding how students learn best. When I decided to remove the student desks from my grade 7 English classroom for the last school year, I was motivated to do so after observing the way my students learned and analyzing how I could best support them in that learning. According to the NEA article “Understanding Universal Design in the Classroom,” the learning space is an important aspect of the whole educational experience: “One cannot have a community of learners without having a positive instructional climate. Instructors help to create this climate by everything that they do, from the way they respond to student questions to the arrangement of the classroom chairs.” For my students, traditional seating hindered their ability to use the classroom in the ways they needed to accomplish the learning goals I set for them as modern learners. The classroom environment should mirror what students will encounter in their future careers, and collaboration, problem solving, and meaning making are at the forefront of most job descriptions. Standard desks situated in rows do not foster open communication and collaboration. Before I moved the desks out of my classroom, I had typically arranged them in partners or small groups to try to facilitate conversation, but traditional desks in groups didn’t foster the personalized, collaborative learning environment my students craved. Once I started researching options to shift the classroom environment, I was careful not to attempt a “Pinterest perfect” classroom and instead maintained focus on the purpose of flexible seating: allowing students a voice and a choice within their classroom. I incorporated various types of seating at different levels throughout the room, and students were able to find workspaces where comfort met capability. 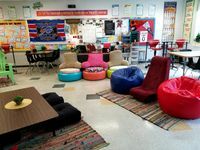 Since I wrote about changing my room a year ago, educators from across the country have reached out with questions regarding how to manage flexible seating in a middle school classroom. Middle school students offer a unique challenge since they are in the midst of adolescence, which brings with it a great deal of change for them. I’ve answered questions on everything from student feedback, funding, parental concerns, and planning for substitutes to basic logistics and materials. There are many ways to address these questions—in the end, a classroom environment is all about the needs of the students within the room. Although I started last school year with no traditional desks in my classroom, I did have traditional options available, such as standard tables with ergonomic plastic chairs. I tried to be sensitive to the needs of all the learners—many students enjoy nontraditional seating options, yet an equal number prefer a standard learning space. Last year I used student feedback surveys in each marking period to determine “home base” seats for my students—where they sit each day for attendance and initial instruction. Having home base seats helped with the distractions and confusion that come with transitions between classes. I also asked whether they wanted any traditional desks—the answer was no—and if they had opinions about the placement of furniture. This feedback was really helpful, especially with multiple classes using the room every day. I made changes to the classroom several times throughout the school year based on what my students suggested, which I strongly believe was a key component to the success of the pilot program. My classroom was in fact their classroom, and being responsive to their changing needs was critical. As summer ends and I think about the furniture I have in my classroom and the new items I acquired through various local grant opportunities, I’m planning multiple placement options for each piece. One benefit of flexible seating that I didn’t anticipate was that when I incorporated station work and students moved to new seats to work with a new group, they seemed more open to collaborating with an assortment of peers in a variety of locations than had been the case with traditional seating. Students are completely capable of doing their best work while stretched out on the classroom floor, sitting in an Adirondack chair, or even curled into a tire seat. I’ve been amazed at the discussions that occurred among my students and the ease with which they shared writing samples and ideas about literary questions with an array of peers. Flexible seating is about more than simply having a variety of different, fun seats in the classroom. It’s about utilizing student voice, creating buy-in, heightening collaborative learning, and prioritizing students’ needs concerning the environment in which they learn. Editor’s note: For much more information on how to make the switch to flexible seating, see The A to Z of Flexible Classrooms.